Hopping around Blogland this last couple of weeks, I kept coming across birds. It seems they are theme of the month in some circles. 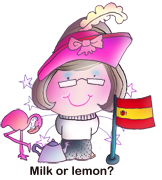 I like to visit Emilia's blog, and she uses a lot of Just Joanna stamps, many of them birds, and a greeting stamp that says Happy Birday. 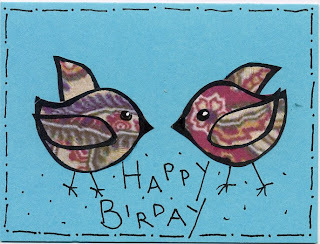 I remember making a birthday card for Lizzie a couple of years ago that had the same greeting and two hand drawn birds with multi-coloured floss tails, so thought I might revisit the idea. I find paper piecing a simple and effective way of quickly producing a card, so I drew out a simple outline, and had a test run using some paisley patterned paper that was lying on my desk. I used a Sharpie to draw the outline, and it bled out a little, so I cut along the centre of the line to reduce it. My handwriting is nothing to write home about, so in an attempt to make this a little less obvious, I staggered the letters...to no avail...it still looks pretty awful. I was quite happy with my shapes, so I cut myself an acetate stencil, and used it to draw more bird pieces, this time using a Staedtler Lumocolor; much finer and no bleeding. For the greeting I resorted to the computer; Girls are Weird font and a whistling bird found in an Easter picture font. I filled a whole page with the script and used a coloured pencil to draw a couple of lines before cutting off a strip. The paper for the birds is a Japanese print off the Canon site, printed when the printer had run out of yellow ink, but still had plenty of cyan and magenta in the three colour cartridge. The last example is a little more masculine in flavour. The paper is gift wrap, the branch is handrawn with little reference to botanical accuracy, and the greeting strip has had a little embellishment that harks back to the trial run. I have made a dozen copies of the pattern, run off a dozen pages of text, and I am hopeful that the Craft Club Ladies will enjoy putting their own twist on the idea on Monday. They will use their own choice of paper and card, and they are going to have to draw in their own versions of legs and eyes, so I am hoping for plenty of variety. 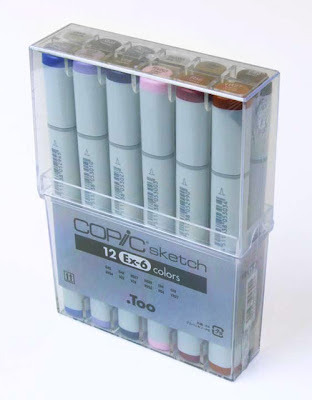 I love them, great idea! 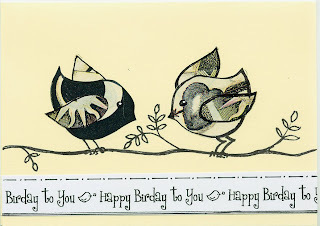 I'm a bird lover too - Happy Birday back at you! 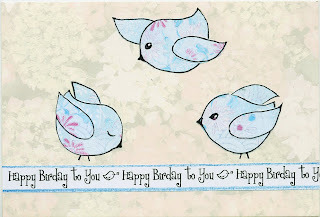 Oh wow, I love your birdy cards! The colours are great(Mr.Pigeon gives a 'coo' of approval too).